Midnight Breakfast is a tradition here at Fairfield. It is a tradition all students, from first years to seniors eagerly await every fall semester, and serves as both a highlight of the holiday celebrations and marks the beginning of finals week. Midnight Breakfast is so popular with students that for this year's event on Dec. 12, the University had three seatings. This year, students were able to listen to DJ Projo, as they waited in line for the main event. 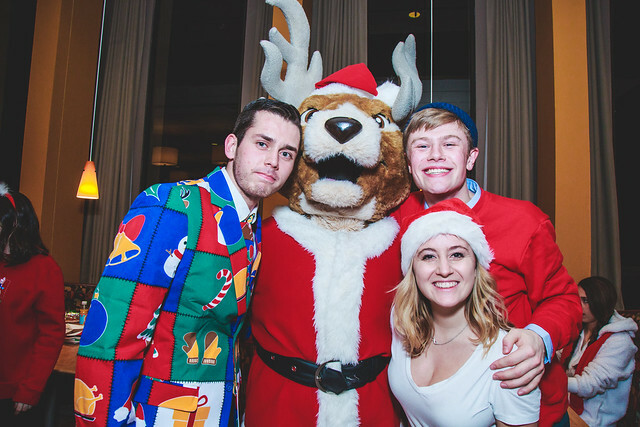 Students dressed in Santa hats and costumes, holiday themed pajamas, and elf costumes could be seen feasting, dancing and singing with their friends and professors. However, the real party did not begin until Mariah Carey’s All I Want For Christmas came on and students jumped up from their seats to sing along with their friends. “This year's Midnight Breakfast was one of the best I've experienced in my time here. Students and staff alike were very energetic and excited, and it was certainly a great way to end our last day of classes and relieve some stress before finals. It's definitely one of my favorite Fairfield traditions,” stated Nicole Funaro ’17. The event is planned by the hardworking and dedicated staff at the Office of Student Engagement with the collaboration of many volunteers including faculty, staff, administration, the University's Sodexho caterers and the Office of the Dean of Students.